He enlisted in the RCAF on August 19th of 1942,in Winnipeg Manitoba. The Rossburn Manitoba native would find it was a long journey both in time and distance to the skies over Europe. Signing up for aircrew brought him to No.7 I.T.S, at Saskatoon in the neighbouring province of Saskatchewan. It would be here that the new air crew recruits would go through a series of tests and exercises that would determine which air trade they would best suited for. By June of 1943, he had completed over 43 hours training as a Bomb Aimer and gunner, at No.6 B&G School at Mountain Ontario. Lindsay then as an Observer had the additional trade of Navigator to be schooled in. The beginning of his Navigation training took him to No.10 Air Observer School at Chatham New Brunswick. Where he had his skills tested as the stations Ansons were directed from point to point by the student Navigators on board. The twin engine Anson which was the same aircraft he had flown in during his Bomb Aimer courses, only this time he would be responsible for charting their course from one location to another with the windows screened over or blacked out. It would appear from the air forces decision to send him to No.1 General Reconnaissance School at Summerside P.E.I. that he was destined for Coastal Command. As the purpose of this training establishment was for pilots and air observers to become familiar with the techniques required for ocean patrols. With months training at his new trade and now overseas he again found himself in training. This time at No.6 Advanced Flying Unit located at Stavrton, Gloucestershire and back again with all purpose Anson as the training aircraft. The course was short by any standards 15 hours daylight flying and 15 hours night time flying. It would be F/O Cox's duty to make them into an effective team, one that would respond swiftly to the perils they would encounter flying through enemy territory. During the short time they would be here the crew would carry out a series of exercises flying in groups or on their own, they would perform bombing practise also in groups and in solo exercises. Working with fighter cover and some mock air attacks would all part of the days and nights at No.22. With a total of a little over 72 hours of flying time the training at Wellesbourne was finished and another stage in their skills laid ahead of them. By early August F/O Lindsay and fellow crew men were introduced to the four engine Heavy Bomber, the Halifax. The crew were now enlarged by the addition of the Flight Engineer Sgt. F Dennis. At some point prior to this, Sgt. Wilkins had taken the place of Sgt. Wainman at some point prior to coming to HCU. For the next two weeks their attention was centered on performing Circuits and Bumps, that is landing then taking right off again. For the gunners there were air to air practise and fighter affiliation exercises. For F/O Lindsay a brief demonstration of the radar then a few practise flights thrown in. In all about 30 hours of training on the radar, a tool which would be used to bring them on target. For a little diversion at the end of his HCU training came what was described as one veteran as a, "cold wet awakening of a possible damp future", dingy training> Both lectures and hands-on, in cold water, in full flying kit. And as others had experienced sometimes it could be in the rain, with the instructor watching while nice in dry in a nearby lean-to. The beginning of September brought F/O Lindsay to Middleton St. George and to the Moose squadron. The squadron already listed two other aircrew named Lindsay, all were also Navigators. Having aircrew with the same last name was not unknown at the 419, even having the men with the same last name being in the same trade during the same time period was not new. But having three with the same last name and also in the same trade was something new. Having completed their conversion training on the Halifax the crew were now faced with a short period of training on the Lancaster X. Although some of the exercises they carried out during these two weeks were the same as those carried out by Lancaster trained crews. The air to air gunnery and solo and group bombing practise runs, allowed F/O Lindsay and his crew to become familiar with the Lancaster. The circuits and bumps in addition to the cross country flights would have given the pilot and the F/E a learning experience on their new aircraft's handling abilities. Gunners would become familiar with their small sections of the aircraft, so as to be able carry out their duties during the darkness of night. As Navigator the tools of his trade would not have changed that much from the Halifax of HCU. But the finding emergency equipment, switches and hatches and his way around inside the fuselage at night would have to become second nature. The crew did not have to wait long and by Mid-September they gathered at the Dispersal area of their charge for the night VR-Z, the famous "Ruhr Express" the first Canadian made Lancaster. The operation was a diversion, the main force of almost 500 aircraft was headed for Kiel. The diversion itself was not a small operation without it's dangers. Over 160 bombers of all types were involved and five aircraft were lost by Bomber Command on this diversional operation. Navigator Lindsay's first accredited operation was on September 25th on Calais, he his crew would continue on for ten more operations into Germany hitting the Krupps Works and Marshalling yards deep in the heavily defended industrial sections. Flak and night fighters protected these areas heavily so the notation, "moderate flak" can be miss-leading. On the October 19th operation to Stuttgart, their Lancaster VR-Q received flak damage to the propeller of one of the starboard engines. The propeller damage was not the only situation the crew faced, there was the added danger of flying at a reduced speed while the bomb bay doors were open from at least one bomb hung up in the rack. After finally managing to safely jettison it they headed for RAF Stradishall. "X" -Oberhausen - 1 x 4000 14 cluster Built-Up Area-Large Fires Attacked By 2 Fighters: Wounded in face- WAG and R/G. Wounded - Crash Landed Manston- Old "U" A Total Wreck Flak Moderate-Pilot and WAG Received D.F.C. - R.G -D.F.M. A simple straight forward record of what he thought was important points to record. For the full view of the events that occurred on KB767 on the return from their target for the night, requires a collection of the information that was recorded within days of the attack on VR-U. These bits of information found in the Combat Reports filed by F/S Toane and Sgt. Wilkins shortly after the well controlled crash landing of their Lancaster. And within the citations given to the men. As F/O Lindsay and fellow crewmen were leaving the target area in the full moon which showed above their port side, fighter flares dropped past them on the starboard quarter. The moon had silhouetted them, and they had been spotted. Nothing happened for the next three minutes, then another flare dropped past the stern of the aircraft and again nothing happened for the next two minutes as the pilot continued on at 15,000 feet on a course of 230 degrees true. At approximately 2042 hours the enemy aircraft was sighted just 250 yards off the starboard quarter , coming in out of the dark side of the sky. The rear gunner Sgt. Toane returned fire but only managed to expend 50 rounds before he was hit. F/O Cox instinctively executed a corkscrew to starboard as he sighted the tracer shells from the FW190. Cannon shells exploded inside the cramped fuselage. The force of the blast threw the upper gunner Sgt. Wilkins out of his gunners seat and on to the floor of the fuselage. Shell fragments flew everywhere starting fires within the fuselage and at the roots of the wings. The fragments also spread out and hit F/O Lindsay in the back and face. Wireless Operator F/O Sitlington who was closer to the upper gunner received wounds to the face and arm. working under the stress of being wounded and the shattered conditions of the aircraft around him. For by now the Lancaster was a downward spiral throwing this small world of the mid-section of the aircraft into a darkened nightmare lit only by the glare of the fires around him. It is not to clear whether it was the same FW190 that again attacked them or a second enemy aircraft. But they were again hit by the enemy fire and more damage occurred as he worked on the fires. The pilot managed to level off the Lancaster and apparently looseing the attackers. But also much needed height was lost. With two engines out it would take time to regain the safety of height as they flew over the enemy countryside. The inside the aircraft was in a bad way, the smoke and smells of burnt equipment, blood, broken glass and debris everywhere. 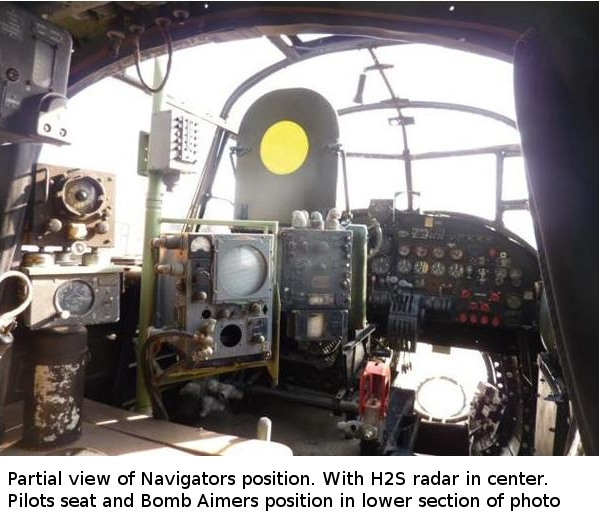 They had lost the intercom throughout the aircraft, the hydraulic system was lost, wireless set was damaged, H2S radar shot up, both turrets were unable to rotate, leavng the crew sitting ducks for any further attacks. Things on the outside were no better the starboard elevators in the tail section were shot away, the two inside engines had to be feathered. They were left with two engines to get them from somewhere west of Oberhausen back to Britain. And they could not fly back in just a straight line to the Channel, they had to thread their way back avoiding heavily defended areas with their flak and search light defenses. The task was up to F/O Lindsay, wounded, drained by the shock and effects felt after an adrenalin rush, working with few instruments, for even the DR compass,( which was a repeater type device that both the pilot and navigator had in front of them. The compasses were connected together so both showed the exact direction of travel ) had also been shot up. But through all this he directed F/O Cox and KB767 back to a base in England. But the journey wasn't over yet, the hydraulics were not working, one wheel had already dropped down with the loss of the hydraulic system. And it mattered little since both tires had been blown during the attack. It was going to be a crash landing at unfamiliar base�s runway. In the end VR-U was a wreck but she and her crew had pulled together and brought them home. This officer was the navigator in an aircraft which attacked Oberhausen. Shortly after leaving the target the aircraft was attacked by a fighter. Extensive damage was sustained. Three of the crew were wounded including Flying Officer Lindsay who was hit in the back; his face was also badly lacerated by fragments of shrapnel. A fire had started in the compartment but he was able to quell it by means of an extinguisher. He afterwards put out another fire which had started in the root of the starboard wing. In so doing his hands were badly burned. Soon afterwards Flying Officer Lindsay fainted through shock. He soon revived when his injuries had been attended to and resumed his duties. Much of his equipment had been destroyed in the fight. Nevertheless, he navigated the aircraft to base. In the face of most harassing circumstances this officer displayed great courage, fortitude and resource. Despite wounds and a severely-damaged aircraft, the crew of the big Lancaster bomber managed to fly back to safety, and the squadron C.O. later termed it "one of the finest examples of crew co-operation and faith in one another I've ever seen". The Canadian built aircraft, operating out of the Moose squadron, was on it's way home from a successful attack on Oberhausen when cannon shells riddled the plane. The rear gunner and the wireless operator were wounded, while the Navigator FO S.B. Lindsay, of Rossburn Man. suffered superficial injuries in putting out the fire in the starboard wing. Two of the Lanc's four engines were knocked out, one on each wing. The knocked out hydraulic system permitted one wheel to hang down. Both tires were blown out and almost all the instruments smashed. The starboard wing was burning and one cannon shell pierced the bomb bay but failed to explode. One explosion blew the mid-upper gunner out of his turret down to the fuselage corridor without hurting him. Lindsay fainted after fighting the fire, but on reviving returned to his duties and guided the aircraft to an emergency aerodrome near the British coast despite the conditions he had to work almost without instruments." "Returning from a successful attack on Oberhausen a Moose squadron Lancaster was attacked by a Nazi fighter or two fighters, suffered extensive damage and three crew members were wounded. By the closest co-operation the crew brought the plane to an emergency field in Britain and affected a landing. One of the wounded men has recovered and the other two, while still in hospital, are out of danger. Pilot of the aircraft was F/O R.L. Cox, Shelbourne Co. N.S. and Navigator was F/O S.B. Lindsay of Rossburn Man. Cannon fire from the fighters knocked out two the Lancasters engines, made the intercom and rear turret useless, knocked out the hydraulic system, which resulted in one wheel dropping down, blew both tires, and smashed nearly all the instruments. The starboard wing was burning and the black out curtains in the pilot's cockpit also took fire. On Landing the undercarriage on one side collapsed and he plane spun round on one wing tip. The crew turned in a good performance in getting home. "One of the finest examples of crew co-operation and faith in one another I've ever seen." commented W/C Doug. Hagersman, DFC, Saskatoon, squadron CO."
Before returning to squadron duties F/O Lindsay and F/O Cox completed some exercises in cross country trips flying in an Oxford. On December 28th, F/O Lindsay was reunited with F/O Cox, F/O Palenek (spelt different ways in the ORB), Sgt. Dennis, Sgt. Wilkins on an operation to Oplanden. New members of the crew were F/S Peter Wiens rear gunner and F/O J.G. Gibbs Wireless operator. The beginning of 1945 saw F/O Lindsay flying two more operations with F/O Cox and this crew. By the beginning of March F/O Lindsay was with a new captain F/O R. W. Millar, and although F/O Palenek was still with Lindsay the other crew members had changed. F/O Palenek would continue to be the Bomb Aimer on operations with Lindsay through to March 12th. Mid-April found F/O Lindsay as Navigator for F/O D.G. Dawson a captain with 22 operations completed. With Dawson he would fly his final two wartime operations. As April saw the closing of the squadrons air offensives, a new task was in the works for all the squadron. Of all the men on board the Lancasters that were to cross the Atlantic, it would be the Navigators that had the lives of the crew in their hands. Once they left the Azores and headed for Newfoundland their high level of Navigation skills were essential in the safe arrival of the crew and aircraft. 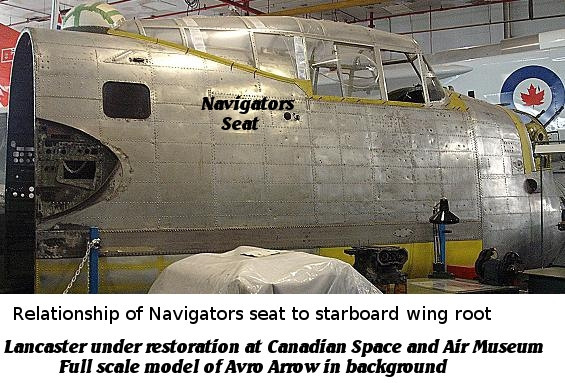 For many of the Navigators of the squadron the training on Astro Navigation would be new, finding their way by H2S radar was no longer available. Learning to shoot the sun was the only way home. For F/O Lawson who had completed the Astro Navigation while he was being trained for coastal patrol so many months ago, that training in Celestial Mechanics must have been great help. Mid-August of '45 was a time of more training, this time as part of the Canadian air forces contribution to the war in the Pacific. More cross country flights in the Nova Scotia area until the squadron operations and training for Tiger Force were discontinued and in the following month the disbandment of the Moose squadron. In all F/O Lindsay had flown over 362 hours during his service career.